Along the way, I stopped at Logos Books in Santa Cruz, an old favorite from college days; Book Haven in Monterey; Phoenix Books in San Luis Obispo; the Book Den and Lost Horizon Bookstore in Santa Barbara; and Bart’s Books (the cool outdoor bookstore) in Ojai. 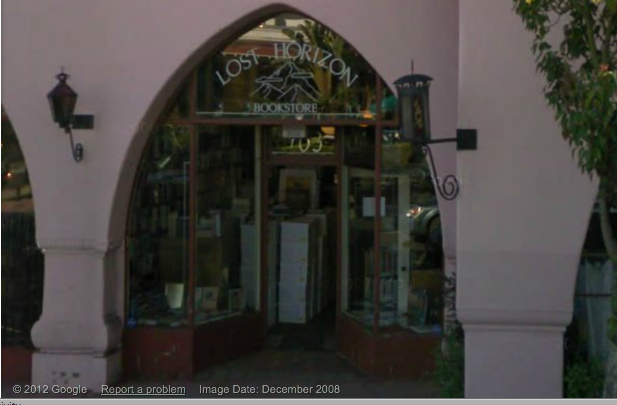 I was looking specifically for books on California History, and FWIW, Lost Horizon was by far the best. The store had all kinds of books I wanted and just could not quite justify paying for (like a complete set of Crespi’s diary from the first overland excursion to Monterey – in Spanish and English). All in all, it was really a pleasant way to spend a couple of days. But what made it a great trip was that I managed to leave enough time to get in a quick surf session at at Mondo’s (in Ventura County) and afterward to pick up a breakfast burrito at Jim and Rob’s Fresh Grill in Ventura. If I were drinking coffee these days, I could have juiced up at Caffrodite next door . . . but I passed on that this time. But back to the bookstore part of the tour, I had hoped to stop at a couple in Berkeley. But I had to deliver spare bicycle tires to my friend Rick who was riding down the coast and took a nail through his brand new Gator Skin back tire about three miles into the ride. Pretty much shot my first day running around to get a new tire, drive to San Jose, pick up another of the party riding down the coast, and deliver him, his overloaded bike, and the spare tires to Sunset Beach in Watsonville. But that’s another story.